How often do you think about your water main? By our estimates, it’s less often than you should. It’s easy to forget that the water in your house is a part of a complicated subterranean system that can sometimes fail. When and if it does, it can be an extremely difficult situation since the main line secures the availability of water throughout your entire home. If it ends up malfunctioning, you’re going to be without working water and probably a place to live for a while! Plus, you’re going to have a pretty hefty repair bill.That’s why it’s crucial that you know the right time to seek out professional water main repair in Seattle. Here are four things to keep an eye out for. Water that is supplied to your home’s plumbing system actually comes up from the street, typically running through a line underneath your yard. We know it can sometimes be hard to tell, especially if you live in Seattle, but if you notice that there is water pooling on your lawn, or if there are patches of soggy grass and mud, it is a good indication that there may be a main water line problem. If ignored, this could cause water to start collecting in your yard and cause some serious damage. No one likes to turn on a faucet to find brownish water running from it. Who knows how long you and your family may have been using this tainted water! Water coloring that looks a bit off color is a sign that your home’s water main line is cracked, allowing dirt to get in and run through your home’s plumbing. 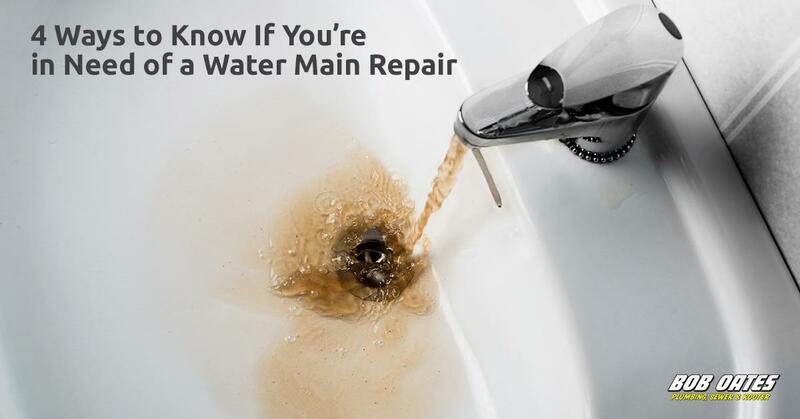 It is also possible that your pipes are corroded or cracked and need replacement, and if you have an older house this is most likely the issue. Many old homes made use of steel or iron piping, which is susceptible to corrosion after a while. A decrease in water pressure is a tricky symptom to diagnose since it’s not a clear indication that you need a Water main repair. There could be more than one reason for low water pressure, including complications on the water company’s side. But, if it doesn’t clear up quickly and/or you notice dramatic pressure changes, it’s possible there is a line leak or blockage. Don’t wait too long for a professional diagnosis! A Bob Oates Plumbing, Sewer, and Rooter technician can quickly tell you if your change in pressure is a serious issue. Nobody likes or expects a high water bill! That is, of course, if you’re not running your faucets constantly or filling up a swimming pool! If you feel like you’ve been using the same amount of water that you usually do, there should not be a substantial change in your water bill. Higher bills could mean that something, somewhere is majorly leaking. Again, you don’t want to be faced with a situation where water is spouting out of your lawn! When this happens, you’ll end up in the midst of a plumbing disaster, and not every plumber is available for emergency water main repair in Seattle like Bob Oates! At [Bob Oates Plumbing, Sewer, and Rooter], we have many skilled technicians who can quickly come to your home, inspect your water main and make any necessary repairs. We have a long history of water main repair in Seattle. It’s important to remember that these issues are not always obvious, and they don’t have to happen together for you to determine whether there’s an issue with your water main. This is why expert advice is key. Bob Oates Plumbing, Sewer, and Rooter is an award-winning and reputable service provider of main water line repair. Our staff is highly trained and equipped with the latest tools and technology necessary to alleviate your home’s plumbing problems. We know how difficult it can be when a water line breaks and you can’t have your most basic needs met. This is why we’re available 24⁄7. Whether it’s a simple issue or a complicated emergency, we’re ready to take it on and help you get you back to your day-to-day life! If you’re in need of a trusted plumbing company that performs water main repair in Seattle, get in contact with us today!